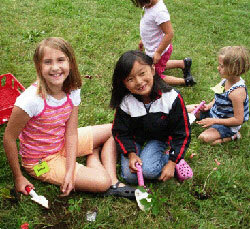 Looking for a fun, outdoor program for your children for this summer? Salt Pond Areas Bird Sanctuaries, Inc. and Cathy Henrich are partnering to offer hands-on activities, crafts, and games centered on the natural environment for children 4-8 years old. Each program will take place at Bourne Farm, from 9am – 1pm, the perfect setting for discovering the outdoors. Participants will go on woodland hikes, explore the pumpkin patch, create craft projects to take home, fish from Crocker Pond and play games of all kinds while simply enjoying the outdoors! Registration fee is $150 per child per session. Participants are to be dropped off by 9 am each day and picked up at 1 pm. Children should bring a light snack, lunch, sun block, and bug spray each day. All sessions include a weekly topic exploration through literature, arts & crafts and exploring all Bourne Farm has to offer! Fishing poles and bait will be provided. Cathy Henrich, former owner, director and teacher at the Woods Hole Village Preschool has spent quality time exploring all nature has to offer with her students. Miss Cathy is currently a substitute teaching in the Falmouth Public Schools. Miss Cathy is pleased to have Amy Webb, as her assistant teacher, who currently works for the Sandwich Public Schools. June 25, 26 & 27th, Tues.-Thurs. – Life on Bourne Farm, then and now! Outdoor Discoveries is pleased to be educating young children about the importance of providing food sources for local bees. Children will help plant bee’s favorite flowers and herbs in our Children’s Bee Garden. Along with learning about the present Bourne Farm, we’ll have fun discovering the past, how did the first family live on the 1775 Crowell–Bourne Farm? We’ll make butter from scratch, try out a few antique farm tools, create scarecrows from the past and the present for our pumpkin patch. July 9, 10 & 11th, Tues.-Thurs. – Camping on the Farm! camping in different terrains, we’ll make s’mores, share some campsite stories, go on a nature scavenger hunt and play some fun outdoor games! July 16, 17 & 18th, Tues.-Thurs.- Marine Life! We will discover the many amazing sea creatures residing off our local shores. This week will include a field trip to the educational filled village of Woods Hole WHOI and MBL, Woods Hole Library, Brian Switzer’s Drama Camp Show and a picnic at Taft’s Playground. Details TBD for field trip day (weather dependent and drop-off/pick up will be by parents in Woods Hole on field trip day). appreciation of creatures in the night and some of the trouble they can get themselves into! We’ll hike the farm and look high and low for nests and habitats!